"Do you feel a creeping, shrinking sensation, Watson, when you stand before the serpents in the Zoo, and see the slithery, gliding, venomous creatures, with their deadly eyes and wicked, flattened faces? Well, that’s how Milverton impresses me." - Sherlock Holmes ("The Adventure of Charles Augustus Milverton," collected in The Return of Sherlock Holmes, 1903). 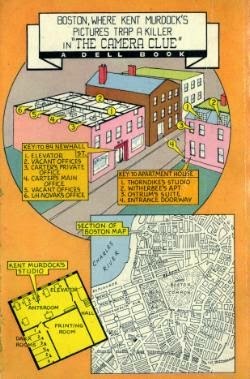 There was a gap in between starting and finishing George Harmon Coxe's The Camera Clue (1937), which is why the details from the first half have fuzzed a bit, but that's a minor obstacle for a hack reviewer like yours truly. 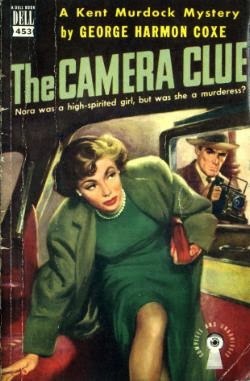 The Camera Clue is the third in a row of twenty-two novels starring Kent Murdock, "the best news cameraman in Boston," who made his first appearance in Murder With Pictures (1935) and in substance a cleaned-up, more likable incarnation of the Black Mask version of "Flashgun" Casey – a crime photographer debuting in 1934. "Planning one," is what Murdock asked Nora Pendleton when she inquired, "what constitutes a justifiable homicide," but her answer is surprising, "I just finished one," and the victim is Jerry Carter – the well-known columnist and blackmailer. Carter has a few indiscrete letters, which could threaten her current engagement with Roger Spalding and a confrontation over them ended with Nora shooting Carter. Twice! Carter crumpled in front of her, but Murdock finds it hard to believe and goes a-snooping. Murdock has his first pick at Carter's private office (the scene of the crime), snaps a few pictures and that's when the trouble begins. There are some familiar faces in a photograph taken of the street, in front of the block of offices, a third bullet fired may exonerate Nora and Murdock's meddling attracts some unwanted attention. All in a days work for a pulp-journalist from the 1930s. My impression, after merely two books, is that the photographic evidence in Coxe's novels function mainly as a safety deposit box for clues rather than for scientific analysis. You can take something away from the crime-scene, but erasing them from a photograph is a lot harder to accomplish – especially back then. You have to destroy them. In the mean time, that's as good as an excuse as any to sick some shady figures on whomever possesses the photographic plates and ground the stories in the hardboiled tradition of the pulp magazines. So not exactly a branch-off of the scientific-and realist school of detective fiction. The ending is actually quite good, in which Murdock devices a Wolfean scheme in order to trap a multiple-murderer and even pulls a frame on another suspect to ensure cooperation, however, the best part was the least-likely-suspect card that was drawn – which probably would've worked better had I read one of the previous books in the series. All in all, a fun, fast-paced mystery of the pulpy, semi-hardboiled kind. Finally, there's a seemingly insignificant part of the solution I need to point out, in which Murdock explains how he basically played a mind trick to prevent the armed murderer from shooting anyone during the confrontation. You can call me crazy, but I think that small bit may have given John Dickson Carr the idea for one of the impossible problems in one of the stage plays collected in 13 to the Gallows (2008). If you reverse what Murdock did there, you have the basics for a trick/solution to build a locked room story around. "To a cop, the explanation is never that complicated. It's always simple. There's no mystery to the street, no arch criminal behind it all." 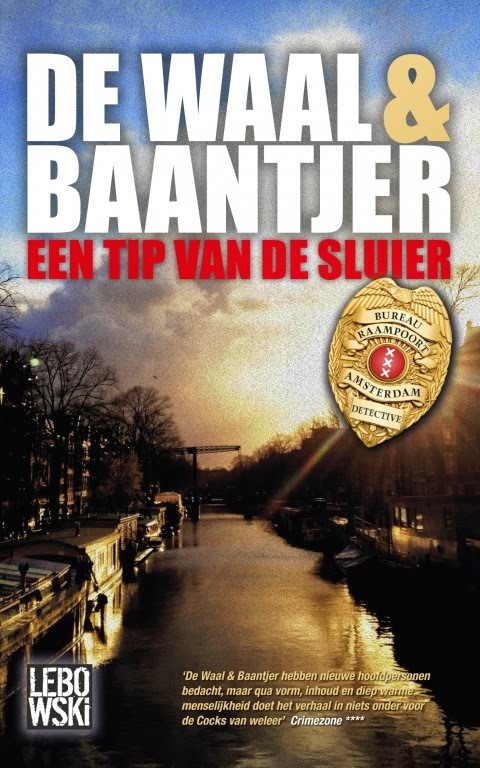 Een tip van de sluier (A Tip of the Veil, 2013) is the ninth in De Waal & Baantjer series about a seasoned homicide detective, Peter van Opperdoes, and his loyal colleague and friend, Jacob. Van Opperdoes was one of the old warhorses of the illustrious Bureau Warmoesstraat, but was transferred to Bureau Raampoort after his wife passed away and continued to have conversations with her ghost – which raised some concerns over his mental health. The supernatural entity, in the guise of a disembodied voice in Van Opperdoes' head, appears to be actually that of his dead wife, because she has knowledge of things yet to come, but observes the rules of fair play by only alluding to them. Actually, the role of the voice has always hovered in the background, but has been reduced even more since De Waal continued the series on his own. Baantjer created Van Opperdoes a few years after his own wife passed away and since the characters are basically stand-ins for the authors, it was personal touch to the old police inspector and probably why the voice is now mainly there to whisper words of comfort or encouragement. In A Tip of the Veil, a surging storm is rocking the old city of Amsterdam, but Van Opperdoes has taken refuge in his favorite café, sipping a late coffee, while the bartender informs him there has been someone looking for him. It was important enough for the man to brave the storm and return to the café. Bob Pals is the man's name and his businesses are entrenched in real-estate, which is an occupation sometimes associated with the underworld over here and Pals' problem seems to have all the earmarks of the criminal classes – there are plans in the works for his assassination. The tip came from a man calling himself "Frits," but Pals isn't willing to part with more information than Frits' phone number. Unusually, for this series, the first three quarters of the book are concerned with a routine investigation of vague death-threats with a murder tugged away at the end of the story. However, the solution of the shooting felt disconnected from the rest of the story and a shameless rework of an episode De Waal wrote for the Baantjer TV-series in the mid-00's. The best part was therefore the routine-investigation, which was lively written with a dose of light-hearted humor and populated with likeable characters. The cast of (semi-) regular (forensic) police characters gathering and analyzing evidence in the background often gives the series a CSI-ish feeling, but often used as a good contrast of between Van Opperdoes' old-school methods and modern police forensics. De Waal succeeded very well in seamlessly meshing Baantjer's style of story telling with his own, which makes this series as enjoyable to read as the original Baantjer series, but there’s one main difference: Simon de Waal is closer to Georges Simenon with De Waal & Baantjer than Baantjer ever was with his DeKok books – which where at least always structured as detective stories. De Waal & Baantjer are stories about detectives rather than detective stories. And, yes, I'm fully aware that I have made that observation before. More than once. But it’s the best possible description of the series. So, all in all, as enjoyable a read as they come in this series and (sadly) better than it's follow up. 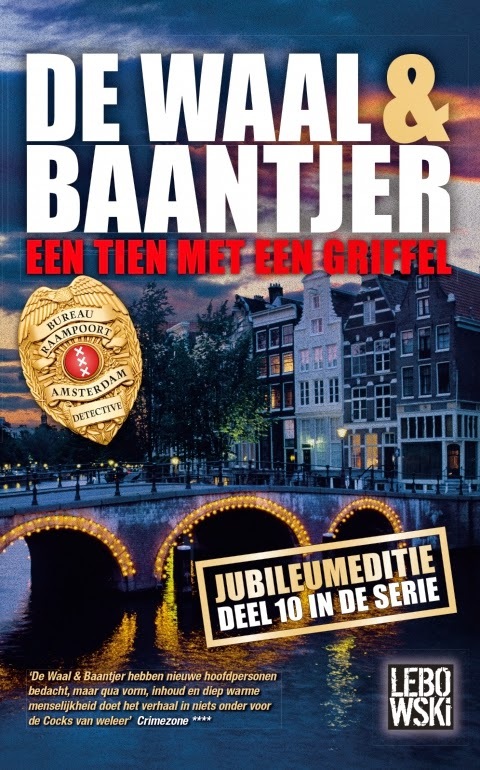 There isn't a literal translation for the book-title of the tenth novel, Een tien met een griffel (Number One With a Bullet, 2014), but the closest equivalent in any language would be a misnomer. The story began promising enough when Jacob whisked Van Opperdoes away from his favorite café to the scene of a crime. A beautiful young woman has been found strangled in the apartment of her neighbor/lover, who's found dead not much later at an abandoned site – shot through the head. It appears to be a murder/suicide until it turns out the "suicide" happened before the murder and suspects begin to appear: an obsessed man and an ex-convict. The murder here is discovered in the first chapter, but the whole book felt more routine than the investigation of its predecessor. Story telling, characters and setting where as well written and brought to life as always, but the plot was abysmally disappointing and simply failed to grab my attention. And plot is kind-of the key point with me. Oh, well, the synopsis of the next one sounds promising and, hopefully, it'll be as good as Een licht in de duisternis (A Light in the Darkness, 2012). By the way, is it just me or does it seem I'm rewriting the same review, over and over again, for this series? "Inquisitive and presumptuous. I do not deny it. But I am a private detective. I am paid to be inquisitive and presumptuous. Not as often or copiously as I would wish, but I am nevertheless inquisitive and presumptuous on a professional basis." Norbert Davis' Oh, Murderer Mine (1946) is the last hurrah for the unlikely tandem of Carstairs and Doan, but the page-count, 120 odd pages, makes it more of a novella like "Holocaust House," published as a serial by Argosy in 1940, than a novel such as Sally's in the Alley (1943). However, Davis knew how to properly jam-pack those pages, but his series detectives deserved a grander exit. Doan is a short, chubby private-eye of the half drunk, shabby variety and Carstairs, a fawn-colored Great Dane, has never been able to reconcile himself with the fact that he's owned by a human of such low stock. I have mentioned in my review of The Mouse in the Mountain (1943) that Carstairs' intelligence gives the series a slight nod in the direction of SF/Fantasy territory, but it made the interaction between Carstairs/Doan possible and that is what's most attractive about these stories – even in the face of a weaker plot. In Oh, Murderer Mine, Doan is hired by "Heloise of Hollywood," whose cosmetic products smear the entire upper crust of Western society, to keep a short leash on her 26-year-old husband, Eric Trent – commercialized in Heloise's ads as "Handsome Lover Boy." Professionally, Trent is a meteorologist and has taken up residents at Breckenbridge University, which means Melissa Gregory (an anthropology instructor) had to give up her office and perhaps even her apartment on the campus ground. I was surprised at this point to find the story shaping up to be college-type mystery, albeit an offbeat one, but than the nightly intrusion happened and were suddenly back in the zany, hardboiled wonderland of Norbert Davis. The intruder clobbers a screaming Melissa to the floor and fires shots at his pursuers, Carstairs and Doan, who fail to nap the thief red handed. And then thing get complicated for them. They may have failed to find the intruder, but they did find another victim. However, Frank Ames, English Professor at Breckbridge, was less fortunate than Melissa: his throat was cut and the body stuffed inside a trashcan. 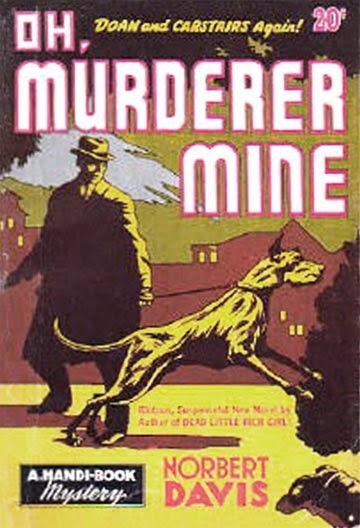 Oh, Murderer Mine has been widely pegged as the weakest of the three books and I agree, plot-wise, but (for me) it’s the same story as with Rex Stout. It's one of those rare series I read for the characters rather than a clever plotting and there were one or two supporting characters that played well off the main protagonists. There's deputy Humphrey, whom impressed me as a deliberate, overdrawn parody of the stereotypical dumb, aggressive police cops from the pulps – 'cause seeing Doan is enough to put him in irons and hurl accusations at him. Humphrey positively gloats and rubs his hands at the prospect of "a chance to peek" at Doan "in the gas chamber," which is about as friendly a gesture as scrawling "I Can Only Tolerate You For So Long" on a brochure for a funeral parlor and shoving it in a lovely decorated Valentine's envelope. A far more pleasant characters, and parody, emerges later on when one of suspects reveals himself as somewhat of a Great Detective working incognito. I liked this character and wished Davis had done more with them as rival detectives, alas, this was to be the last novel in the series. There's a definite decline in quality here, but the weakness of Oh, Murderer Mine lay mainly in the overly complicated, twisted explanation that felt too heavy for the light, semi-hardboiled comedy mystery that preceded it – dragging the rest of the story down with it. The solution even revealed a complicated murder method for a death that was mentioned in the background of the story and could've easily been a short story (or epilogue) in itself. However, the rest is pretty much what you'd expect from a Carstairs and Doan mystery. The high point of that was the trail of destruction Carstairs left at the salon of Heloise, which reminded me of the subway riot caused by H.M. in Carter Dickson's A Graveyard to Let (1949). Recommended to fans only. "The culprit must turn out to be a person who has played a more or less prominent part in the story—that is, a person with whom the reader is familiar and in whom he takes an interest." 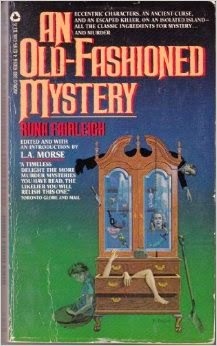 I came across an entry for An Old-Fashioned Mystery (1983) by Runa Fairleigh while thumbing through Robert Adey's Locked Room Mysteries (1991), a regular feeder line these days, and the publishing date in combination with the detectives being listed put the book (possibly) in the same category as Herbert Resnicow's excellent Alexander and Norma Gold series from the 1980s. However, Sebastian and Violet Cornichon weren't the wisecracking, mystery solving husband-and-wife team I expected to find, but a brother and sister who exchange snappy remarks. Oh, and they're twins. Sebastian was born four minutes before Violet and therefore inherited everything, which now finances his lavish and loose lifestyle, and cultivated a penchant for making remarks/jokes that could be argued suffer from bad timing. In defense of my favorite character from the book, and to quote comedian Doug Stanhope, "they just died, it's perfectly timed." On the other hand, Violet had to work hard on her cosmetic line and earned the moniker of Society-Girl Detective by helping the police close one or two open cases – which proved to be the best kind of advertisement for her business money can't buy. 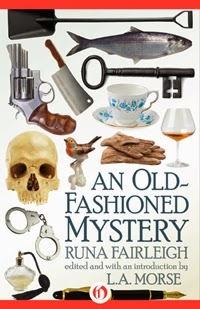 But first things first, because if I have to start anywhere, it's with the introduction, entitled "The Mystery Runa Fairleigh," written by crime novelist L.A. Morse, on the manuscript of An Old-Fashioned Mystery and the questions left behind by its author. Thee decades before, Fairleigh purchased one of the smaller of the Thousand Islands, somewhere near the border between the United States and Canada, where she lived the solitary existence of a hermit before disappearing from the face of the Earth – leaving only 288 pages of a type written manuscript behind. Morse ends the introduction with the following observation: "However, it might equally well have been titled The Last Mystery, since it is most definitely the mystery to end all mysteries. Indeed, it may be the eschatology of the mystery." Well, that's a case to be decided by the individual reader, but it's without a doubt one of the most flattering homage’s to Agatha Christie I have read to date. The first and obvious inspiration for An Old-Fashioned Mystery was And Then There Were None (1939) and the backdrop is an old, gothic-style manor house, complete with battlements, on the isolated Komondor Island. It's a place with a chequered history: a cursed place where rumors of buried treasure from the Revolutionary War linger on and people continue to die under mysterious or absurd circumstances. A previous owner and notorious prankster was shot in the face when he sneaked up on someone who was fooling around with a shotgun. Komondor Island is the place Rosa "Mousey" Sill has picked to celebrate her 25th birthday and gaining full control of her trust fund, but the party that has been put together couldn't have ended any other way than in bloodshed. First of the unlikely table companions is Mrs. Cassandra Argus, Mousey's deranged godmother and involved in the boating accident that killed her mother, which took a toll on her mental conditions and now shrieks eerie sounding prophecies. Beatrice "Budgie" Dijon is Mousey's aunt and the wife of the insufferable Colonel Nigel Dijon, who seems obsessed with smacking people and actually shocked to find out the cook, Mr. Ching, is an "Oriental." You have to be pretty racist, if that is your first complaint considering the quality of Mr. Ching's cooking. Derrick Costain is Mousey's well-dressed fiancé and rumored gold digger. Mr. Eustace Drupe is the dome-headed lawyer and trustee of Mousey's funds, but, since this is a detective story, Drupe is one of those "Wicked Uncle Andre" types. Cerise Redford and the housekeeper, Mrs. Hook, round out the party and they mix, socially, as well as soccer fans of opposing teams and beer. Fortunately, they soon stumble over the first body in the coal pile and it's been neatly chopped up, and from here on out the plot is compartmentalized in murder blocks: a murder is committed and Viola thinks she has pieced together the solution only to be upset by another murder. The (false) solution that tied together the first three murders can easily stand on its own (great clueing) and the case Violet made against her own brother was simply amusing – an (unconscious) spoof of the case against Roger Sheringham from Anthony Berkeley's Jumping Jenny (1933)? I surely got the impression Morse Fairleigh knew her classics. By the way, Drupe was killed in a locked room, but Violet completely forgot about the impossible angle until the story was nearing its end and the explanation was perhaps the only part of the story that should've stayed in the past (somewhere around the mid-to late 1800s). This compartmentalized story telling helped in keeping the insanity in proper bounds, until the end, because the mounting terror of being picked off one-by-one wasn't enough. There had to be a radio broadcast on the only station they could receive, Big Band Era station, announcing a mass murderer had escaped from a high security prison – and he's familiar with the island. On a side note: I suspect Kanari Yozaburo from lifting bits and pieces of the plot for The Legend of Lake Hiren (1994) and given his own interpretation to other aspects of the plot, which wouldn't be the first time. The Mummy's Curse (1993) is basically an abridged version of Soji Shimada’s The Tokyo Zodiac Murders (1981). I know the line between emulation and copyright infringement can be sketchy at times, but Yozaburo walked that line as if it was the Silk Road during its heyday. Picking up ingredients here and there when it was time to hand in a new manuscript. But I'm getting off-topic here and long-winded. I'm not sure what I liked more about An Old-Fashioned Mystery: the story or the solution. The former has a lot of interesting detective work and a galore of red herrings for genre savvy readers to slip on. I had solutions based on The Murder of Roger Ackroyd (1926), Death on the Nile (1937) and After the Funeral (1953), but the actual explanation is something else. Originality is a bit of an overused cliché when reviewing books, but here you might actually have something that's original and you could even argue "transcends" the genre. Some will love it (I think I do), while others will probably hate it and call shenanigans, but it was fairly clued – though I can definitely see why some would label it a rule breaker. But if it's a rule breaker, it's a classic of its kind. A great play on playing with the readers' expectations. And appreciated the cameo of a famous mystery writer in the final chapter. I would recommend An Old-Fashioned Mystery the strongest to devotees of Agatha Christie and people who have read altogether too many mysteries. They'll probably appreciate the book the most! Let the reader be warned: the book contains a few puns and word jokes. No idea why everyone hates them. And to readers new to Golden Age detectives and neo-classical mysteries: never, ever take Van Dine's rules too seriously. "And there's no doubt he has fifteen or twenty pasts; I know that much about him." Last month, Curt Evans posted a notice on The Passing Tramp, "Stout Reads: See What Rex Read and How He Rated It," informing us there were books for sale once owned by Rex Stout and some were rated. 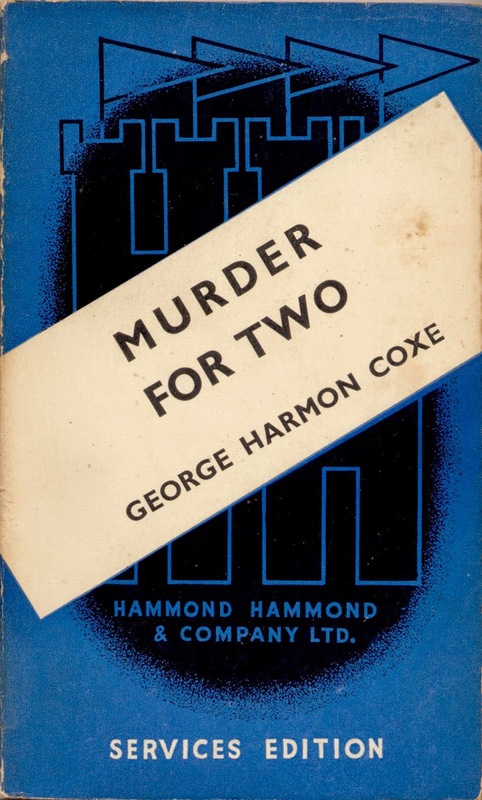 The highest ranking mystery novel from the lot was George Harmon Coxe's Murder for Two (1943), which was awarded with an A-minus by Stout and that was enough to pique my interest. Jack "Flashgun" Casey is a journalist/photographer of the hardboiled kind and began his career in a series of short stories, published in Black Mask, followed by a handful of novels, radio plays, movies, a TV-series and even a short lived comic book incarnation – on which Stan Lee was an editor. Murder for Two begins with Casey returning to the office building of the Express, after being rejected by the Army on account of a bum knee, when the managing editor has a surprise for him: he has take Karen Harding, whose father is a major stockholder in the newspaper, along on assignments to show her the fieldwork of reporting. And their first stop is Rosalind Taylor. Taylor is a nationally syndicated writer of columns crusading "against industrialists who would not co-operate with labor unions, and against the unions themselves when run by unscrupulous leaders" as the "public champion of the under-dog" and has had Matt Lawson in her crosshairs for a while. Lawson is as unscrupulous as they come, but as of late, he has been reinventing himself as a patriot with war contracts and new inventions like Everflow – a new compound that makes oils flow at low temperatures. A young man, John Perry, who was swindled out of his rights by Lawson and, as a bonus, pressed charges against Perry for assault, invented the compound. As Rosalind Taylor remarks, "he and his kind do more to hurt the war effort than any other single class," but as perfectly cliché as Lawson is for the role of corpse, it's Taylor who's found inside her own car – shot through the back of her head. Here's where the pace of the story begins to pick-up and, while you keep reading, there were portions of the story that simply went through the motions of a hardboiled detective story. Casey is struggling through out the book with two musclemen, in pursuit of photographic evidence snapped by Karen Harding, and they regularly poke a gun in the photographer's face. Of course, this eventually results in old-fashioned fisticuffs. The policemen in Murder for Two, Lt. Logan and Sgt. Manahan, are of the friendly variety, however, search warrants aren't always a necessary tool of their trade. At one point in the story, Lt. Logan opens a door with a skeleton key and answers Casey's comment on the obvious illegality of the act with a dry "so they tell me." If the story had been written today, I'm sure Logan would've been a suspect on account of a past Taylor column highlighting his unconstitutional police methods. Throw in a murdered witness, an attempted murder and several stand-offs/kidnappings at gunpoint and you've got yourself a pulpy, hardboiled mystery within the sleazy newspaper-and racketeering business. However, there's something genuinely clever about the solution. I would even say that the relationship between the murderer and victim, in combination with the motive, is an original take on the racketeering angle and probably enough to warrant Stout's admiration – especially from an author's point-of-view. And I guess Stout found some of the aspects in Murder for Two reflective of his own work, such as a hardboiled flavor with a whodunit angle and running after evidence secured in then modern recording equipment (e.g. Alphabet Hicks, 1941 & The Silent Speaker, 1946), which could explain why Stout slapped an A-minus on it (the minus symbolizes objectivity) where someone else would've probably rated it a bit lower than that. But it's still a good, fun and fast-paced mystery that's worth your time if you have a copy knocking about or come across one. Especially if you like Rex Stout and Erle Stanley Gardner.